Beneath the Stains of Time: Martians, Go Home! - Reportedly seen on a wall in a hall at NASA's Jet Propulsion Laboratory, Pasadena, California, after losing contact with the Mars Polar Lander, 1999. Malevolent ghosts emerging from their molding mausoleums, rooms which kills those left alone in them, vampires who dead awaken from their day-time slumber and vindictive curses hacking away at the branches of an ancient family tree had their respective turns as stage props for the locked room mystery in order to provide a backdrop harking back to the ink induced nightmares of Edgar Allan Poe and M.R. James. Some of them have since become tropes, but in the hands of a skillful writer they are still effective embellishments for the impossible crime story. Not so familiar are the, unfortunately, rare occasions when a visitor from the outer regions (read: SF-genre) wrote a locked room story festooned with the unknown horrors from the uncharted regions of outer space. Well, that's not quite true. The ones I have read were light-hearted and almost playful. Mack Reynold's The Case of the Little Green Men (1951) is an oddball private eye novel, in which an even odder group of SF-fans hire a run-down, failed detective to investigate the presence of alien life forms on Earth, who are taking shots at them with ray guns or throwing them from their flying saucers – one of them taking a hit while at a costumed science-fiction and fantasy convention. I thought this was far more engaging, funnier and better plotted than Anthony Boucher's Rocket to the Morgue (1942), which had one of the most disappointing locked room tricks and it's only redeeming quality as a novel was its depiction of the 1940s SF-community, and even that was done better by Reynolds. All the same, I did grin at one of the characters take on the genre, stating that the fourth dimension takes the problem out of a locked room for science fiction writers, but, as a detective story, it never really left the launching pad. Yes, The Case of the Little Green Men should be added to my list of favorite impossible crime stories. The American science-fiction writer Fredric Brown, who regularly descended back into the atmosphere for his second profession as a mystery novelist, gave us another specimen in Death Has Many Doors (1951) – in which his nephew-uncle team of private detectives, Ed and Ambrose Hunter, attempt to help a weak-hearted woman who's being menaced by Martians! It's an unlikely story, to say the least, but Ed is determined to restore Sally Doerr's disturbed peace of mind, convincing her to spend the money she had scrapped together to hire a detective on a psychiatrist instead and plants himself on her couch for the night to stand guard against any threats – terrestrial, extraterrestrial or imagined. Unfortunately, being a good detective does not necessarily mean that you are a reliable bodyguard or an alert watch dog (c.f. Martin Méroy) and at the dawning of a new day he finds Sally dead in her bed. Her heart had simply stopped beating. Everything indicates a natural death: a medical history and the fact nobody could've gotten to her. The apartment door was locked from the inside, the windows were fastened and the dust of the day lay undisturbed on the windowsill, Ed was flat on the couch standing guard and the roof was recently tarred – leaving it soft and unmarked by any footprints. But an unknown voice on the phone, claiming to be a Martian, retains the services of the Hunters to investigate her death and spirits a crisp $1000 note into their office as a retainer. Sally's sister, Dorothy, also turns up with premonitions of her own impending doom and Ed decides to take her out town and sticks to her like a shadow, but is unable to prevent another death. You could consider this second murder an impossible one, but the solution is a flat-out cheat and Ed's moronic behavior only made it worst. Death Has Many Doors has a lot of the elements in common with the marvelous Night of the Jabberwock (1951), in which a small town newspaper editor tumbles down the rabbit's hole, and the short locked mortuary story "The Spherical Ghoul," combining the intelligence of the ratiocinative detective school with the exterior of the hardboiled private eyes – except not as good. Sally's idée fixe isn’t developed into anything more than the delusions of a confused young woman and that their source of her fancies is obviously from fairly early on they hold no horrors whatsoever. If this book had been written by John Dickson Carr, we would’ve at least got a terrifying account of an encounter with these Martians and their possible involvement in the death of Sally would’ve been played up a lot more. The idea of the first locked room trick was not bad, but it's not terrific, either, as you can easily guess the raw method of the solution (have seem them too many times) and the finer details require a bit of technical knowledge. Death Has Many Doors comes up a bit short as a detective story, but I would lie if I said I did not enjoy the ride in spite of its imperfections. Still, I would not recommend this book to readers who are new to Fredric Brown and advice to start out with Night of the Jabberwock. Isn't funny that my biggest exposure to science-fiction comes from detective stories? 'original literary form.' If you haven't yet discovered it, Tomcat, I suggest you track down a copy! 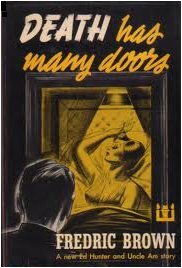 In the meantime, I commend you for your honest review of 'Death Has Many Doors' by Fredric Brown, an author whose works are too neglected these days. I've heard of Curme Grey's Murder in Millennium VI, but I haven't stumbled across a copy yet. But I will keep your recommendation in mind. I appreciate the comment, Sergio! Death Has Many Doors was supposed to be part of a two-volume omnibus collection, a complete set of the Ed and Am Hunter novels, but the second volume was never published. The Langtail Press also seems to be dead in the water. So your best shot is to look online and I don't think this book is that rare. Good luck!